Bulgaria is a transit country for immigration into Europe. Although the overall numbers of migrants entering the country have been smaller than in neighbouring Poland and Hungary, Bulgaria has been pressured by the European Union to restrict irregular entrants. Many observers are concerned that Bulgaria will not be able to cope with the expected increases in the numbers of people who will attempt to use the country as an entry point into Europe once it joins Schengen, which is scheduled to occur in late 2011 or 2012 (Tsvetkova 2011). The response in Sofia has been to focus on improving border security and interdiction (Al Jazeera 2011). This focus has spurred criticism from rights groups, who argue that asylum seekers are facing undue restrictions. Describing the new detention centre in Lyubimets, where refugee claimants have been detained, an official from the UN High Commissioner for Refugees (UNHCR) said, “This place is not meant and not designed and not appropriate for asylum seekers” (UNHCR 2011). Key norms. Bulgaria’s immigration norms and regulations are contained in the Law for Foreigners in the Republic of Bulgaria (LF), the Law on Entry, Residence and Exit in the Republic of Bulgaria of EU Citizens and their Family Members (LEUCFM), the Law on Asylum and Refugees (LAR), and the Regulations for Implementation of the Law for the Ministry of Interior. Both the LF and LAR have been amended since 2007 to include new EU measures, such as the 2008 European Return Directive. Grounds for detention. Foreign nationals in Bulgaria can be detained and expelled if they have: a) entered the country illegally; b) overstayed their permit; c) stayed using false or forged documents; or d) been deemed a threat to public order or national security (LF, Art. 41/2). Foreigners detained under these circumstances are held at the Busmantsi and Lyubimets detention centres, located outside Sofia and close to the Bulgarian border with Turkey and Greece, respectively (LF, Art. 44(6)). The language used in these laws can be misleading. Detention is referred to in the LF as “coercive accommodation,” while migrants are ”accommodated” and not “detained” (Ilareva 2007a). The Busmantsi and Lyubimest facilities are officially referred to as “Special Homes for Temporary Placement of Foreigners” (BHC 2010; CPT 2008). Administrative agencies. Immigration policy in Bulgaria falls under the Migration Directorate (MD) of the Ministry of Interior (MOI). Established in 2003, the directorate is responsible for the administrative control of foreign nationals. Article 44(6) of the Law for Foreigners gives the MOI the authority to issue detention orders to migrants. It is in charge of the management, maintenance, and security of facilities used to detain foreign nationals awaiting deportation (MD website). The MOI is also home to the National Service Border Police (NSBP), a specialized agency responsible for securing and managing Bulgaria’s borders. Its main duties are the prevention, detection, and investigation of crimes related to illegal immigration (NSBP website). Under Article 86 of the MOI regulations, the Border Police can arrest migrants attempting to illegally cross the border and place them in specific detention premises. When dealing with asylum seekers, the Migration Directorate and the Border Police work in cooperation with the State Agency for Refugees (SAR) (see Regulations for the MOI, Art. 88b). The SAR manages Bulgaria’s facilities for asylum seekers, including transit centres, registration-and-reception centres, and integration centres (LAR, Art. 47(2)). Length of detention. After adopting the European Return Directive 2008/155 in May 2009, Bulgaria reduced its maximum limit on the detention of migrants to six months, as per Article 15 (5) of the directive. Before this change, migrants could be held in detention indefinitely. In “exceptional” circumstances detention can be extended up to 18 months, but only after the case has undergone judicial review. The court’s decision in these cases is made every six months and is not subject to appeal (see amended Law for Foreigners, Art. 44 (8); Art. 46a (3)(4)). Moreover, the review process is held behind closed doors without the detainees present. This has been criticised as a violation of the right to an oral hearing before the court (JRS 2010, p. 143). In a December 2009 ruling, the European Court of Justice held that Bulgaria must abide by detention limits in the case of Said Kadzoev. Kadzoev, a Russian national of Chechen origin, had been detained at the Busmantsi detention centre in Sofia since October 2006 awaiting deportation. After emphasizing that foreigners can only be detained if there is a reasonable opportunity for deportation, the court ruled that Bulgarian authorities were obliged to “observe the absolute maximum 18-months period of immigration detention and to release Said Kadzoev immediately” (BHC 2009). The ruling has been hailed as a victory for migrants and a precedent in EC law by several human rights groups. However, since the directive does not cover repeated detentions, there are still concerns that once migrants are released they will simply be picked up again and be detained for another 18 months (Kostadinov 2010; BHC 2009). In a 2010 report published by JRS-Europe, the Bulgarian Helsinki Committee (BHC) reported that the average length of detention at the Busmantsi detention centre before implementation of the Return Directive was just over 14 months. 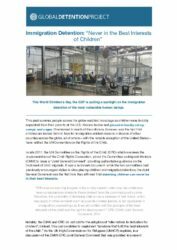 This was significant as it represented the highest detention duration among the 23 member states covered in the report (JRS 2010). When the Global Detention Project contacted the BHC in mid-2010, nearly a year after the directive was implemented, the group reported that the average length had decreased to less than 10 months, still higher than the standard maximum (six months) provided for in the directive (Savova 2010c). As of mid-2011, according to BHC, the six-month maximum was generally being applied (Savova 2011). Access to appeal. Specific deadlines for the appeal process were included in amendments to the Law for Foreigners in 2009. Under Article 46a, migrants can appeal their detention, but they must do so within three days of being placed in the detention centre. The administrative court must make a decision on the appeal within one month. The act of appealing does not suspend the detention order (LF, Art. 46a). Human rights groups have criticised the three-day deadline as being unreasonably short, particularly since translation services are not always ensured for detainees. In a 2010 report, JRS-Europe argued that it undermines detainees’ ability to develop a proper legal defence against their detention order (JRS 2010, p. 143). In a December 2010 report, BHC advocated for an amendment to the Law for Foreigners to address this discriminatory provision (Savova 2011). In January 2011 the law was amended to the current deadline of seven days and the appeal is heard by the court in open sessions (amended Law on Foreigners, Art. 46a(1) and (2)). Asylum seekers. Bulgarian law does not provide an explicit rule for detaining asylum seekers. Under the Law on Asylum and Refugees, migrants seeking asylum must submit their application in person to either the SAR or another government authority, who must then pass it along to the SAR. Within 15 days, asylum applicants must be informed about how the asylum procedure works, what their rights and obligations are, and the names of organisations that provide legal and social assistance to foreigners (LAR, Art. 58). While awaiting a decision, which can take several months, asylum seekers are accommodated in one of Bulgaria’s two non-secure Reception and Accommodation Centres (RACs) (LAR, Art. 29(4); Savova 2010a). Migrants who submit an asylum application after being detained for illegally entering or staying in Bulgaria are held in one of the country’s two detention centres. In theory, this detention is meant to be temporary until transfer to one of the RACs is possible (JRS 2010). According to a source at the Bulgarian Helsinki Committee (BHC), until the beginning of 2010, asylum seekers could spend up to four months in detention before being released to one of the RACs. Under more recent practice, asylum seekers in this situation spend approximately seven to 30 days at the detention centre before being transferred to an RAC (Savova 2011). Asylum seekers in detention are at risk of being deported before they are transferred to an RAC, although instances of this are rare. This is due to the delay between when an application is submitted and when it is officially registered (Savova 2010a; Ilareva 2007b). In its 2009 annual report, the BHC highlighted the case of Turkish national Veisel Aktash, who was deported by the Migration Directorate “in contradiction with Bulgaria’s international obligations in the field of asylum and refugees and the EU’s acquis communautaire” (BHC 2010). Asylum seekers whose applications have been rejected are supposed to remain within an RAC if they are appealing the decision. It is only if the appeal has also been denied that they are moved to a detention centre to await deportation. However, according to the Inter Press Service, rejected asylum seekers held at a detention centre can remain in detention “for years while authorities sort out their documentation and return trips” (Ciobanu 2009). Bulgaria has two dedicated migrant detention centres: the Busmantsi Detention Centre—sometimes referred to in official documents as the “Special Home for Temporary Placement of Foreigners”—which is located near Sofia (BHC 2010; CPT 2008); and the Lyubimets Detention Centre—or the “Specialized Center for Temporary Accommodation of Foreign Nationals”—situated near the border with Turkey and Greece (UNHCR 2011; Tsvetkova 2011). The Busmantsi center was established in March 2006 “as a civilised solution to the challenges Bulgaria faces as an EU ‘frontier’ country” (Kostadinov 2010). The facility has an estimated capacity of 400 (Savova 2010c). Some 100 were being detained at the centre as of July 2010 (Ciobanu 2010). According to a source at the Bulgarian Helsinki Committee (BHC), the average length of detention at the Busmantsi facility is 4-10 months (Savova 2010c). The Lyubimets detention facility opened in early 2011. Described by the country’s interior ministry as a fulfilment of Bulgaria’s Schengen requirements (Koleva 2011), Lyubimets was reportedly built with funding under the Schengen accord and has a capacity of 300 (EuroPost 2011). Bulgaria is scheduled to open a “transit centre” for asylum seekers in Pastrogor, also near the Turkish border, in 2011 (Tsvetkova 2011). Billed as a necessary addition to the country’s asylum infrastructure, the Pastrogor Transit Centre, which has a capacity of 300, has been criticized by some observers who claim it will operate as a “closed” (or secure) facility that denies asylum seekers freedom of movement (Ilareva 2011). Other observers, however, have offered a different characterization, saying that the transit facility is intended to be non-secure (Savova 2011). As of this writing in August 2011, the facility had not yet opened. Built with funding from the EU Phare Programme (Tsvetkova 2011), the transit centre is reportedly “designed to house people undergoing the Dublin procedure on determining the responsible Member State and for fast-track processing of manifestly unfounded applications of ‘illegally staying foreigners’ (Article 47, Paragraph 2.1. of the Law on Asylum and Refugees). According to an official with the State Refugee Agency, which will manage the Pastrogor facility: “The Transit Center in Pastrogor is a very important unit of the agency. Currently the agency has two units, a reception and registration center in Sofia and another such center near the southern town of Nova Zagora. The two centers’ capacity however is insufficient and the new Transit Center is expected to fill in the gap. It is close to the Specialized Center for Temporary Accommodation of Foreign Nationals in the village of Lyubimets, at the Migration Directorate of the Interior Ministry. The centers being close to each other will help facilitate coordination between institutions. For example, if an economic immigrant is refused protection he will be moved to the center in Lyubimets where from he will either be taken out of the country, sent to a third country or to his country of origin” [sic] (quoted in Tsvetkova 2011). There are two non-secure Reception and Accommodation Centres (RACs) for asylum seekers in Bulgaria: one within the premises of the State Agency for Refugees in Sofia; and one in the village of Banya near Nova Zagora, approximately 300 kilometres from Sofia. Both were established in 1999 and are managed by the SAR (IOM 2008, pp. 49-50; UNHCR 1999). The capacity at the centres is usually at 100 percent (300 at Sofia and up to 100 at Banya) (Savova 2010c). The Global Detention Project classifies the RACs as non-secure facilities because individuals are not prevented from leaving the facility after going through an initial medical examination (LAR, Art. 29(4)). In exceptional cases, migrants are quarantined while undergoing the exam (Savova 2010a). Once the tests are completed, asylum seekers are free to leave the centre during the day or night. They need only ask permission if they wish to leave the centre to find new accommodation (Savova 2010c). Lastly, the National Service Border Police (NSBP) operates a small facility at the Turkish-Bulgarian border checkpoint of Kapitan Andreevo. It is used to hold migrants detained by the border police for up to 24 hours, after which they must either be released or transferred to the detention centre in Busmantsi (Savova 2010a). Because confinement at the police facility is under 72 hours, the Global Detention Project does not classify it as part of Bulgaria’s overall immigration detention infrastructure. Conditions. The Busmantsi and Lyubimets detention centres are reportedly prison-like in appearance and operation. They have high walls topped with barbed wire, and security guards make use of cameras and restricted areas (Ilareva 2008; Savova 2011). Conditions at the Busmantsi centre have consistently been criticized by human rights groups, particularly in light of recent highly publicised cases of mistreatment. Observers have also expressed concern about the lack of information provided detainees (JRS 2010). The most common complaint from detainees has been inadequate health care. According to the Bulgarian Helsinki Committee (BHC), “alongside protracted periods of detention, malnutrition and lack of psychological support, one of the most recurrent problems reported by detainees is extremely poor levels of medical care, lack of medicines and treatment.” As the BHC highlights, rather than employing a permanent medical staff, the Busmantsi centre brings in doctors and nurses on a monthly rotational basis. This makes monitoring and treating detainees difficult (Ciobanu 2009). According to a 2010 survey conducted by JRS-Europe at the Busmantsi detention centre, almost 90 percent of detainees reported feeling unsafe because of a deterioration in their health. Food was largely reported as unpleasant, lacking variety, and in very small portions. Detainees also indicated that poor nutrition was a constant stress and nearly three-fourths of those surveyed reported that they did not sleep well (JRS 2010). The absence of proper medical care has been blamed as a cause for the death in October 2009 of Hasun Albaadzh, a Syrian national who had been held at the Busmantsi detention centre for 34 months. According to reports by the Justice 21 Civil Initiative, Albaadzh’s repeated requests for medical attention were ignored, and he was not taken to a hospital despite the fact that his medical conditions were known by the centre’s administration (ACET 2009). In another case, Jonson Ibitui, a Nigerian national, died of a heart attack shortly after being released from the Busmantsi facility. One human rights group has argued that “the massive heart attack came as a result of the psychological stress and is a direct consequence of the…one year meaningless detention in the centre” (ACET 2009). There have also been numerous reports of guards mistreating detainees (U.S. State 2010). The 2010 JRS-Europe survey indicated that 44.4 percent of respondents reported feeling “very unsafe,” mainly because of the security guards (JRS 2010). Demanding more humane treatment, better living conditions, and health services, detainees at the Busmantsi centre have staged several hunger strikes and protests in recent years. A hunger strike in February 2010 came to an end only after facility management promised to improve conditions (Kostadinov 2010). Criticism has also been levelled against the conditions at Bulgaria’s two Reception and Accommodation Centres in Sofia and Banya. A 2008 report from the European Refugee Fund highlighted that the centres had poor living conditions and lacked accessibility for disabled people (ERF 2008). 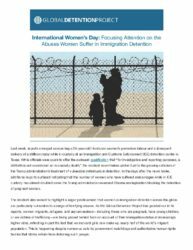 The 2010 JRS-Europe report also highlighted that in practice, the lack of capacity in the RACs “resulted regularly in detention” of asylum seekers “with physical or mental disabilities, pregnant women and families with children” (JRS 2010). From 15-19 December 2008, the European Committee for the Prevention of Torture (CPT) visited the Busmantsi detention centre (CPT Press Release 2008). As of July 2010, CPT had yet to publish the report of the visit. The CPT was scheduled to revisit the country in 2010 (CPT Press Release 2009). Bulgaria operates two dedicated immigration detention centres, with a combined capacity of 700. Due to its geographic location, Bulgaria is often used as a transit country by migrants. In 2010, a total of 1,705 third-country nationals were apprehended in Bulgaria for irregular presence, all of which were ordered to leave the country. 295 of these were returned by Bulgarian authorities, and 210 of those returned were sent to a third country (European Commission 2011, p. 76). Some 3,070 individuals were refused entry to Bulgaria in 2010; two at a land border; 60 at a sea border; and 455 at an air border (European Commission 2011, p.78). This figure represents more than half of the number of migrants refused entry into the country in 2005 (IOM 2008). There were a total of 19 unaccompanied minors registered in Bulgaria in 2010 (European Commission 2011, p.81). The routes used by asylum seekers run most often through Turkey and more rarely through Romania and Greece (ERF 2008). In 2010 a total of 1,025 asylum applicants were registered in Bulgaria; 515 decisions were made, of which 140 were positive and 375 were negative. Of the positive decisions, 20 people were granted refugee status and 120 were granted subsidiary protection (European Commission 2011, p.79). According to a report from Radio Bulgaria: “Some 1,000 individuals annually seek asylum in Bulgaria. A peak of asylum seekers was seen in 2001-2003 when the armed conflicts in Afghanistan and Iraq raged with the greatest intensity. In 2002 alone 5,000 looked for asylum in this country. After that their numbers began to decline reaching a low of just 600 in 2006” (Tsvetkova 2011). In 2009, 850 applications were submitted to the State Agency for Refugees compared to 750 in 2008 and 980 in 2007 (UNHCR 2010). This is a significant decrease from earlier in the decade, when asylum applications peaked at nearly 3,000 in 2002 (SAR 2010b). Very few of these asylum claims, however, are accepted. In 2009, only 39 asylum seekers were granted refugee status while 380 were refused. In 2010, of the 1025 asylum applications received, the SAR accepted only 20 while refusing 386. One hundred-eighteen were granted humanitarian status (SAR 2010a; Savova 2011). Altogether, 580 asylum seekers were detained in 2010, 380 (or 65 percent) were released in less than a month; 183 were border applicants; and another 397 applied from the Busmantsi detention center (BHC 2010; Savova 2011).The majority of asylum seekers in 2010 came from Iraq, with 452 claims made in that year (SAR 2010). Other top places of origin in 2009 were the Palestinian territories, Afghanistan, Iran, and Armenia (UNHCR 2010). Since implementing the European Return Directive in May 2009, the average length of detention has dropped to six months (Savova 2011). In 2006, the Bulgarian Helsinki Commission reported that estimates of the country’s undocumented population were between 30,000 and 50,000 (BHC 2006). The BHC estimated that it had dropped to 10,000 by 2010 (Savova 2011). Al Jazeera. 2011. “Inside a Bulgarian Detention Centre.” Al Jazeera. 6 June 2011.http://www.aljazeera.com/video/europe/2011/06/2011664513210679.html(accessed 7 July 2011). Assistance Centre for Torture Survivors (ACET). 2009. Website. “Organizations for Protection of Human Rights Insist for Transparency and Responsibility.” 9 October 2009. http://www.acet-bg.org/index.php?lang=2&pid=2 (accessed 5 May 2010). Bulgarian Helsinki Committee (BHC). 2010. Human Rights in Bulgaria in 2009: Annual Report. BHC. April 2010.http://www.bghelsinki.org/upload/resources/Human-Rights-in-Bulgaria-en-2009.pdf (accessed 26 July 2010). Bulgarian Helsinki Committee (BHC) Press Release. 2009. "Bulgarian Human Rights Groups Win Victory at the European Court of Justice Upholding the Rights of All Immigrants in Europe." BHC. 3 December 2009.http://www.bghelsinki.org/index.php?module=news&lg=en&id=2976(accessed 28 April 2010). Bulgarian Helsinki Committee (BHC). 2006. Research of the Rights of Migrants in Bulgaria from a Human Rights Perspective: Final Report. BHC. November 2006. old.bghelsinki.org/upload/resources/MigrantsRightsReportENG-1.doc (accessed 10 August 2011). Bulgarian Ministry of Interior (MOI). Web site. Chief Directorate “Border Police”.http://www.mvr.bg/en/AboutUs/StructuralUnits/National+MoI+Services/BorderPolice/default.htm (accessed 12 May 2010). Bulgarian Ministry of Interior (MOI). Web site. Migration Directorate.http://www.mvr.bg/en/AboutUs/StructuralUnits/National+MoI+Services/Police/dir_migracia.htm (accessed 12 May 2010. Bulgarian State Agency for Refugees (SAR). 2010a. Information for asylum seekers and decisions taken, 1 January 1993 – 31 May 2010. State Agency for Refugees with the Council of Ministers. 2010.http://www.aref.government.bg/docs/0510Applications_Decisions_1993-2010-english.xls (accessed 22 July 2010). Bulgarian State Agency for Refugees (SAR). 2010b. Charts, 31 May 2010. State Agency for Refugees with the Council of Ministers. 2010.http://www.aref.government.bg/docs/0510Charts_website_english.doc(accessed 22 July 2010). Bulgarian State Agency for Refugees (SAR). 2008. Annex 1: Multi-Annual Programme. European Refugee Fund Department. 2008.http://www.aref.government.bg/ebf/docs/ERF3-%20MPR%20engl.pdf(accessed 28 April 2010). Ciobanu, Claudia. 2010. “Refuge Can Get Worse Than Rejection.” IPS News. 23 July 2010. http://ipsnews.net/news.asp?idnews=52249 (accessed 26 July 2010). Ciobanu, Claudia. 2009. “Migrants Denied Even Medicine.” IPS News. 17 October 2009. http://ipsnews.net/news.asp?idnews=48903 (accessed 28 April 2010). CPT Press Release. 2009. “Council of Europe anti-torture Committee: visits in 2010.” European Committee for the Prevention of Torture and Inhuman or Degrading Treatment or Punishment. 3 December 2009.http://www.cpt.coe.int/en/visits/2009-12-03-eng.htm (accessed 26 July 2010). CPT Press Release. 2008. “Council of Europe anti-torture Committee visits Bulgaria.” European Committee for the Prevention of Torture and Inhuman or Degrading Treatment or Punishment. 22 December 2008.http://www.cpt.coe.int/documents/bgr/2009-01-05-eng.htm (accessed 26 July 2010). European Commission. 2011. Commission Staff Working Paper: Accompanying the document: Communication from the Commission to the European Parliament and the Council Annual Report on Immigration and Asylum (2010). European Commission. COM(2011) 291 final. Brussels. 24 May 2011. EuroPost. 2011. “Bulgaria: Refugee detention facility opened in Lyubimets.”EuroPost. 19 March 2011. George Bakalov Ministries. 2009. Website. “Bulgarian Human Rights Organizations Demand Transparency and Accountability from the Government.” 14 October 2009.http://www.georgebakalov.com/_blog/Current/post/Bulgarian_Human_Rights_Organizations_Demand_Transparency_and_Accountability_from_the_government/ (accessed 28 April 2010). Hershman, Gabriel. 2009. “Syrian immigrant dies in Bulgarian detention centre.” The Sofia Echo. 19 October 2009.http://sofiaecho.com/2009/10/19/801875_syrian-immigrant-dies-in-bulgarian-detention-centre (accessed 28 April 2010). Ilareva, Valeria. 2011. 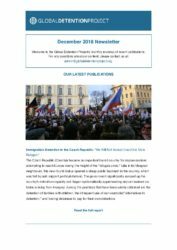 “Bulgaria and UNHCR’s urban refugee policy.” Fahamu Refugee Legal Aid Newsletter. 1 June 2011.http://frlan.tumblr.com/post/6068737555/bulgaria-and-unhcrs-urban-refugee-policy (accessed 7 July 2011). Ilareva, Valeria. 2008. Immigration Detention under International and EC Law. Conference paper for the International Conference of the Refugee Law Reader “The Dynamics of Refugee Protection in an Era of Globalization.” Brussels. December 2008. http://lcri.hit.bg/LARC_paper_Ilareva.pdf(accessed 26 July 2010). Ilareva, Valeria. 2007a. 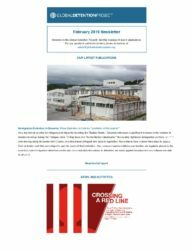 Immigration Detention in International Law and Practice. In Search of Solutions to the Challenges Faced in Bulgaria. December 2007. http://www.statewatch.org/news/2008/jan/valeria-iIlareva-immigration-detention-bulgaria.pdf (accessed 26 July 2010). Ilareva, Valeria. 2007b. 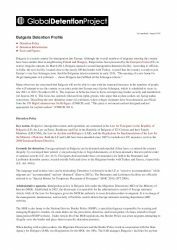 “Bulgaria’s treatment of asylum seekers.” In Forced Migration Review, Issue 29. December 2007.http://www.fmreview.org/FMRpdfs/FMR29/60-61.pdf (accessed 28 April 2010). International Organization for Migration (IOM). 2008. Migration in Bulgaria: A Country Profile. IOM. October 2008.http://publications.iom.int/bookstore/free/Bulgaria_Profile2008.pdf (accessed 28 April 2010). Jesuit Refugee Service (JRS). 2010. 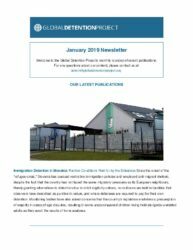 Becoming Vulnerable in Detention: Civil Society Report on the Detention of Vulnerable Asylum Seekers and Irregular Migrants in the European Union. JRS-Europe. June 2010. http://detention-in-europe.org/images/stories/DEVAS/jrs-europe_becoming%20vulnerable%20in%20detention_june%202010_public_updated%20on%2012july10.pdf (accessed 19 July 2010). Koleva, Juliana. 2011. “Bulgaria’s ‘Disappeared’ Refugees.” Balkan Insight. 16 June 2011. http://www.balkaninsight.com/en/blog/bulgaria-s-disappeared-refugees (accessed 30 June 2011). Kostadinov, Petar. 2010. “The Bousmantsi Triangle.” The Sofia Echo. 26 February 2010. http://sofiaecho.com/2010/02/26/864702_the-bousmantsi-triangle (accessed 1 June 2010). Law on Asylum and Refugees. 2002. Prom. State Gazette No. 54. 31 May 2002 (as amended 29 June 2007).http://www.aref.government.bg/docs/ZUB-TRC-2007-1181.doc (accessed 28 April 2010). Law for Foreigners in the Republic of Bulgaria. 1998. Prom. State Gazette No. 153. 23 December 1998 (as amended 6 April 2007).http://www.mvr.bg/NR/rdonlyres/8C3CCC42-3E72-4CBB-900A-E8CB6DE82CAD/0/ZVPNRBGESChTS_EN.pdf (accessed 28 April 2010). Ovcharov, Svilen. 2008. ENAR Shadow Report 2007: Racism in Bulgaria.European Network Against Racism (ENAR). October 2008.http://cms.horus.be/files/99935/MediaArchive/national/Bulgaria%20-%20SR%202007.pdf (accessed 26 July 2010). Regulations for Implementation of the Law for the Ministry of Interior. 1998. Prom. State Gazette No. 113. 30 September 1998 (as amended 18 February 2005). http://www.mvr.bg/NR/rdonlyres/FC70BFFB-F945-462D-9040-909FCDD67BC9/0/01_Rules_Law_MoI_EN.pdf (accessed 12 May 2010). Saïd Shamilovich Kadzoev v. Direktsia 'Migratsia' pri Ministerstvo na vatreshnite raboti. 30 November 2009. European Court of Justice. Case C-357/09. http://www.unhcr.org/refworld/docid/4b14ecb090c1.html (accessed 28 April 2010). Savova, Iliana (Bulgarian Helsinki Committee). 2010a. Interview by Alex MacKinnon (Global Detention Project). Phone conversation. 26 July 2010. Global Detention Project. Geneva, Switzerland. Savova, Iliana (Bulgarian Helsinki Committee). 2010b. Interview by Alex MacKinnon (Global Detention Project). Phone conversation. 7 June 2010. Global Detention Project. Geneva, Switzerland. Savova, Iliana (Bulgarian Helsinki Committee). 2010c. Email message to Alex MacKinnon (Global Detention Project). 8 June 2010. Global Detention Project. Geneva, Switzerland. Savova, Iliana (Bulgarian Helsinki Committee). 2011. Email message to Michael Flynn (Global Detention Project). 4 August 2011. Global Detention Project. Geneva, Switzerland. Sofia Echo. 2011. “New detention centre for refugees opens in Lyubimets.”Sofia Echo. 15 March 2011.http://www.sofiaecho.com/2011/03/15/1059378_new-detention-centre-for-refugees-opens-in-lyubimets (accessed 22 June 2011). Tsvetkova, R. 2011. “Bulgaria and the common European policy for refugee.”Radio Bulgaria. 9 May 2011. United Nations High Commissioner for Refugees (UNHCR). 2010. Asylum Levels and Trends in Industrialized Countries: 2009. UNHCR. March 2010.http://www.unhcr.org/4ba7341a9.html (accessed 28 April 2010). United Nations High Commissioner for Refugees (UNHCR). 2011. “Crossing a border irregularly is not a crime for a refugee.” UNHCR. 9 June 2011.http://www.unhcr-centraleurope.org/en/news/2011/crossing-a-border-irregularly-is-not-a-crime-for-a-refugee.html (accessed 11 August 2011). U.S. Department of State. 2010. 2009 Human Rights Report: Bulgaria. Bureau of Democracy, Human Rights, and Labor. 11 March 2010.http://www.state.gov/g/drl/rls/hrrpt/2009/eur/136024.htm (accessed 5 May 2010). Migration Directorate, Ministry of Interior. Response to Access Info Europe and the Global Detention Project freedom of information request. 12 September 2013. Ministry of Interior (Bulgaria), "Monthly Information on the migration situation in the Republic of Bulgaria for December 2017" (In Bulgarian: Месечна информация относно миграционната обстановка в Република България за месец декември 2017 г. ), December 2017. State Agency for Refugees (Bulgaria), Decision No RD 05-466/19.06.2018 to provide access to public information, Foundation to Access for Rights, 19 June 2018. Eurostat. Asylum and Managed Migration. Enforcement of Immigration Legislation.Third country nationals refused entry at the external borders. Foreigners in the Republic of Bulgaria Act. State Gazette No. 153/23.12.1998. Last Amendment, SG No. 53/27.06.2014. Bulgaria Administrative Procedure Code  State Gazette 30 from 11.04.2006, last amended State Gazette 27 from 25.03.2014 (APC). Foreigners in the Republic of Bulgaria Act. State Gazette No. 153/23.12.1998. Last Amendment, SG No. 53/27.06.2014. Article 44. Report to the Bulgarian Government on the visit to Bulgaria carried out by the European Committee for the Prevention of Torture and Inhuman or Degrading Treatment or Punishment (CPT) from 25 September to 6 October 2017, Strasbourg, 4 May 2018, paragraphs 59 – 60. Foundation for Access to Rights – FAR, Analytical report on the exercise by detained immigrants of the right to be heard in Bulgaria, 2016, Section 3.3. Ministry of the Interior, Decision No 812104 – 158 of 29 June 2018 to provide access to public information, 29 June 2018. Foreigners in the Republic of Bulgaria Act. No. 153/23.12.1998. Last Amendment, SG No. 53/27.06.2014. Art. 44 (9) (Last Amendment - SG No. 23/2013). Valeria Ilareva (FAR), Email to Michael Flynn (GDP), 29 January 2019. §35 [...] The CPT must stress once again that deprivation of asylum seekers of their liberty should be resorted to only exceptionally, after a careful examination of each individual case, and should be applied for the shortest possible time; further, the lawfulness of such a measure should be open to challenge before a judicial authority. When asylum seekers are deprived of their liberty as an exceptional measure, they should be kept separately from foreign nationals who have not lodged an application for international protection. The Committee calls upon the Bulgarian authorities to act in accordance with these precepts. In those instances where there are exceptional reasons for depriving an asylum seeker of his/her liberty while awaiting the outcome of his/her application, such reasons should be fully documented. In this connection, the delegation learned that a new establishment for the temporary placement of foreign nationals was expected to open in 2011 in Lyubimets, near the border with Turkey, and that persons who had applied for asylum might be detained there. The CPT would like to receive detailed information on the new facility (e.g. capacity, structure, categories of persons held, etc.). 39. The CPT recommends that the management of the Special Home for Temporary Placement of Foreign Nationals in Busmantsi continue to deliver a clear message to all staff members that the ill-treatment of detained persons (whether of a physical or verbal nature) is not acceptable and will be the subject of sanctions. Further, the Committee recommends that the management and staff exercise increased vigilance and make use of all the means at their disposal to prevent inter-detainee violence and intimidation. 43. The CPT reiterates the recommendations made in the report on the 2008 visit that steps be taken at the Busmantsi Home to:- ensure occupancy levels in the dormitories which guarantee a minimum of 4 m² per detained person; - restore the broken furniture and sanitary facilities to a good state of repair and provide sufficient funding for running repairs; - ensure that detained persons have ready access to a toilet at all times, including at night; - review the provision of personal hygiene products and appropriate clothing and footwear to detainees. Further, the Committee invites the Bulgarian authorities to review the food arrangements in the Busmantsi Home in order to ensure that the dietary habits and needs of detained persons are being adequately catered for. It would be useful to involve detainees in the setting up of food menus, to reflect better the range of different dietary habits. §47 The CPT recommends that steps be taken to strengthen the provision of health care to foreign nationals detained at the Busmantsi Home, and in particular to: reinforce the health-care team by appointing at least one more nurse; ensure that detained persons have unrestricted and reasonably rapid access to the doctor and outside specialists, including to dental care; provide interpretation in cases when medical staff cannot communicate with detained foreign nationals; ensure that detained foreign nationals are fully informed of their treatment. §48 [...] The Committee recommends that the Bulgarian authorities reinforce the provision of psychological care to foreign nationals detained at the Busmantsi Home. § 51 [...] The CPT recommends the Bulgarian authorities seek ways to improve channels of communication between SAR and the Busmantsi Home with a view to better informing detainees of their situation. §53 [...] The CPT reiterates its recommendation that the Bulgarian authorities take steps to ensure that foreign nationals detained at the Busmantsi Home receive, when necessary, the assistance of qualified interpreters. The use of fellow detainees as interpreters should, in principle, be avoided. §54 [...] The CPT recommends that the Bulgarian authorities take effective steps to ensure that foreign nationals subject to coercive administrative measures (including those facing expulsion on grounds of national security) benefit from an effective legal remedy enabling them to have the lawfulness of their detention decided speedily before a judicial body. This judicial review should entail an oral hearing with legal assistance, if necessary provided free of charge to the person concerned, and interpretation. Moreover, detained foreign nationals should be expressly informed of this legal remedy.